Wear them - seems obvious but it minimises stress on the baby and on you having to clip them in and out of your stroller. Also frees your hands for security, tickets etc. You can wear them through security provided yours is a material-only wrap and they just swab your hands. Pack layers: you will need to strip your baby down to nothing to compensate for stuffy, hot planes pre-flight and them layer them like winter bunnies when mid-air. Prepare for Strangers and Crew interrupting a 'calming pre-nap' moment. You will end up back at square one multiple times... just make sure you have your patience ready. They will undoubtedly 'oo' and 'ahh' in your baby's face just as they closed their eyes. If you are in an airport and run out of diapers, go to Baggage Reclaim and find a customer service desk for the airline you are with. They will hopefully give you diapers in the size you need. Eat well if breastfeeding. Find snacks and meals regularly and hydrate! Sounds obvious but you will be less mindful of this amidst stress, exhaustion and broken meal schedules. Find Family Bathrooms. This are wonderful. Space for you, the stroller, your travel companion, bath bath if you need to (explosive nappies happen during flights) and noone can interrupt. 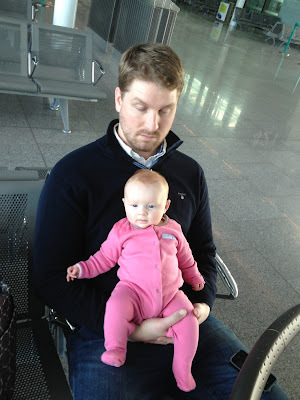 For more on these see: Flying with OUR baby - the tragic comedy of travel!! 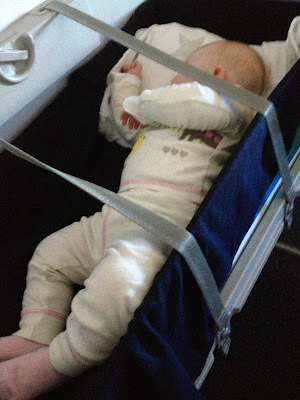 Just FYI - Aer Lingus literally have a cardboard box that sits on a shelf and then you have to put straps across your baby like this.... it was a little much. 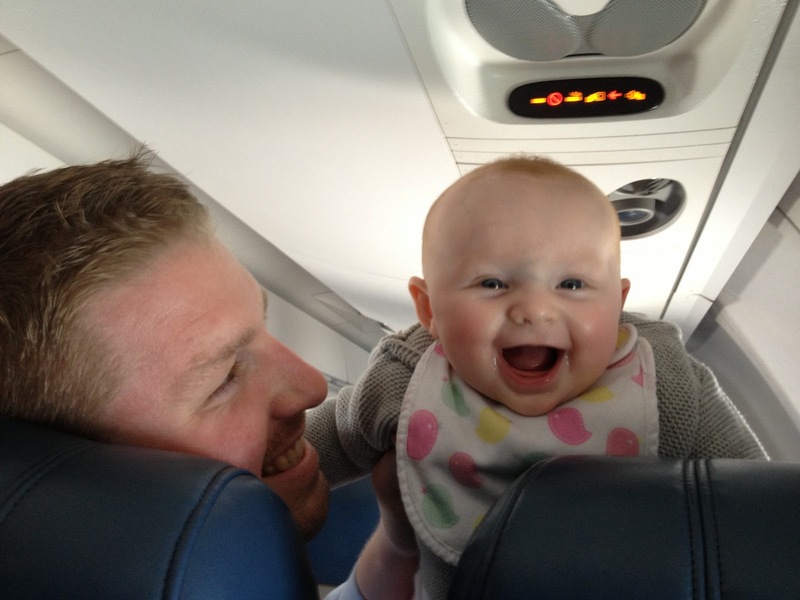 We were meant to fly Delta who have nice canvas bassinets.... expect the unexpected folks!